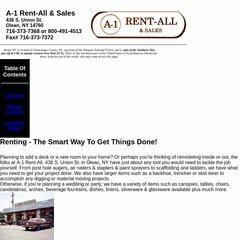 Topics: Item List, Things To Rent, Item List, and Things To Rent. A-1rentall.com's IP address is 66.39.43.28. Its 2 nameservers are ns000.ns0.com, and ns61.pair.com. It is hosted by Pair Networks (Pennsylvania, Pittsburgh,) using Apache/2 web server. PING (66.39.43.28) 56(84) bytes of data. Pinging the server, resulted in a 37.9 ms response.